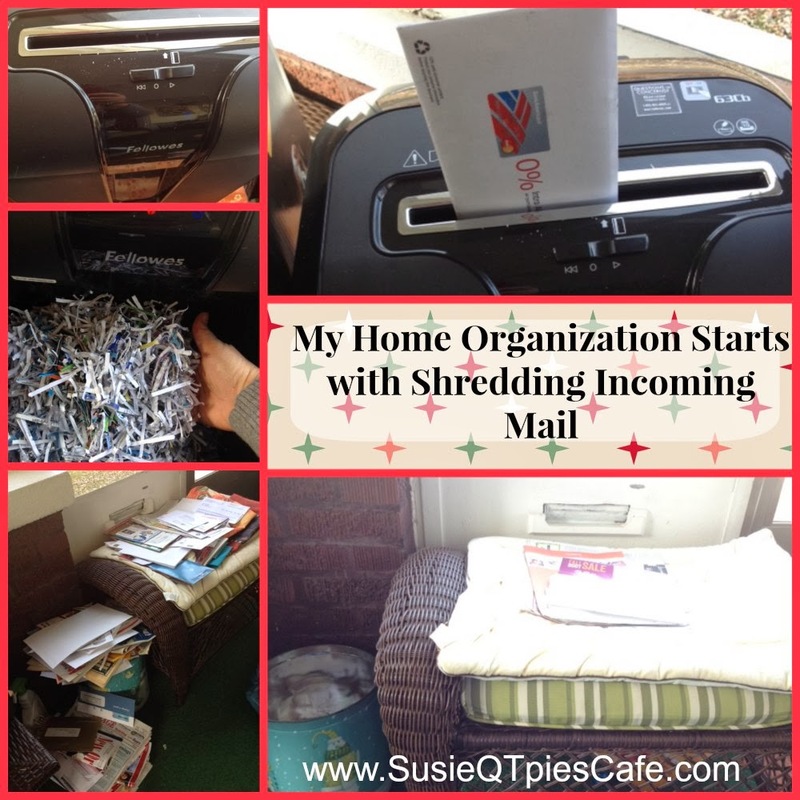 I don't know about your home but in mine the most disorganized spot is the mail slot area! Our mail comes through a mail slot on our enclosed front porch. Unwanted mail and junk mail sits and waits for me to rip up and throw away. This only happens once a few months and so it piles up and it bothers me. Here is how I'm now keeping it organized on a daily basis. As a Work At Home Mom I take care of most household chores as well as working as a full time online Virtual Assistant. Sometimes certain chores are just that, a chore I do not want to do. The one area that drives me crazy every day is the mail slot. The hubby and teens take what they want and the rest of the mail sits there waiting for me to throw away or rip up. As you can see from my video and photos I do not do this chore very often. Today I'm thrilled to show you that I now have my mail slot under control, thanks to my brand new Fellowes Powershred 63Cb. I am loving it. My mail slot area is tidy! Every day we can take the new mail in the house and shred the junk mail. I can powershred right at the mail slot. What are some of your greatest challenges in your home when it comes to organization? What stresses you out? What do you leave until the last minute to take care of? I'd love to know. I now feel better that I can shred credit card applications, loan applications as well as any other piece of mail or junk mail we no longer want or need. My Fellowes 63Cb shredder has all the great features I have always wanted in a shredder. I love the Jam Blocker (I have used it at least 5 times), SafeSense to keep little fingers and paws safe, and Energy Saving Technology. The shredder is so easy to use that I wanted to make popcorn and sit back and let my teens do the job during the initial major clean up job. If you are in need of a shredder check out Fellowes. This would make a wonder Christmas gift! This model retails for $149.99 through Amazon, Office Depot and Office Max. Follow Fellowes on Facebook, Twitter and Pinterest to learn more about their products.